He graduated from M.B.Hrekov State Art School in Odessa in 1978 / Painting Department / and Kharkiv Art and Industry Institute in 1983 by specialty of graphic artist / graphics faculty/. Member of the National Union of Artists of Ukraine, Board Member of the Kharkiv National Union of Artists of Ukraine. Winner of international competitions of satire and humor. Leonid Storozhuk had been working in the Children and Youth Creativity Palace for 27 years, he organized and directed “TELEKOMIKS”, a television animation studio, where young film and video artists were trained. The studio received numerous awards and Grand Prizes of various festivals of children’s creativity over the period of its existence. The TV program for Kharkiv TV channels was created. The “TELEKOMIKS” studio was invited many times to “Artek”, an international children’s camp, where programs for international film festivals of ARTEK were created. 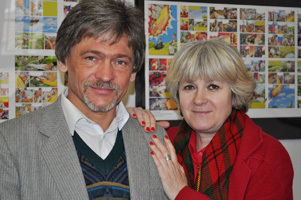 * 2012 – Kyiv (Ukraine) – Third Award for the best cartoon. “Series of Sports cartoons” – 100 paintings. (1987), ink, pen, paper (300 х 200). Series of cartoons “Line” – 100 drawings (1990 – 2003), ink, pen, paper (200 х 300). Series of cartoons „Power” – 10 drawings (1990 р. ), ink, pen, paper (300 х 200). Series of cartoons “Music” – 10 drawings (1987 – 1990 р. ), ink, pen, paper (300 х 200). Series of cartoons “Cars and People” – 15 drawings (1989 – 2003), ink, pen, paper (200 х 200). Series of cartoons “Terrorism” – 10 drawings (2003 р.) gouache, paper (300 х 200). Comics “Optics” of the series: “Educational Comics” – 50 drawings (1990), ink, pen, pencils (210 х 300). Publications. Moscow 1990. Comics “Ukrainian Folk Tales” – 90 drawings (1993), ink, pen, water colors (300 х 400). Publications. (Co-author V. Storozhuk) Kharkiv. Comics “Flying Women” (Ukrainian Folk Tales) – 47 drawings, ink, pen, gouache (300 х 400). Series “Ordzhonіkіdzevsky district”, Kharkiv – 15 drawings (2002-2004), gouache (300 х 400). Series “Humorous Painting”. 2012-2014 Canvas, oil, 60х80. Series of fiction television films of “TELEKOMIKS.” (1991 – 2003) (S-VHS format), from 2 to 10 minutes – 40 films. By involving children. Television film “Seminars of cartoonists” (2004) DV format, 30 minutes. Kyiv. During the period of education, cooperation with the Academy of Design and Arts, Leonid Storozhuk proved himself an active and creative teacher demonstrating high professional skills of pedagogical activity, responsibility and initiative in all its events. The animation workshop managed by Leonid Storozhuk created a variety of educational works of students, from the drawn animation to the modern computer animation. In July 2008, Leonid Storozhuk as one of Ukrainian plein-artists took part in the creative journey across Chuvashia: “III International Kokelevskyy Plein Air” resulting in a solo exhibition of creative works. He worked together with Stella-Systems LLC as an artist and designer, illustrator of educational projects in 2009-2013. In August 2009, Leonid Storozhuk was awarded the honorary title “Honored Artist of Ukraine”. Meet-the-artist events and workshops: “Workshop on animation basics for teachers and heads of studios for children”, Kharkiv, 2013, Workshop on animation basics for children and teachers of art studios, Surgut, Russia, 2013. Meet-the-artist events and workshops of children’s television festivals “DYTYATKO”. Since 2013, he has been working as Assistant Professor of the faculty of architecture, design and fine art at O.M. Beketov National University of Urban Economy in Kharkiv. Associate Professor of the department of drawing and painting. Director of the TV studio of the university. – “Cartoon, caricature, grotesque painting for April Fool’s Day”, 2015, O.M. Beketov National University of Urban Economy in Kharkiv, Kharkiv.